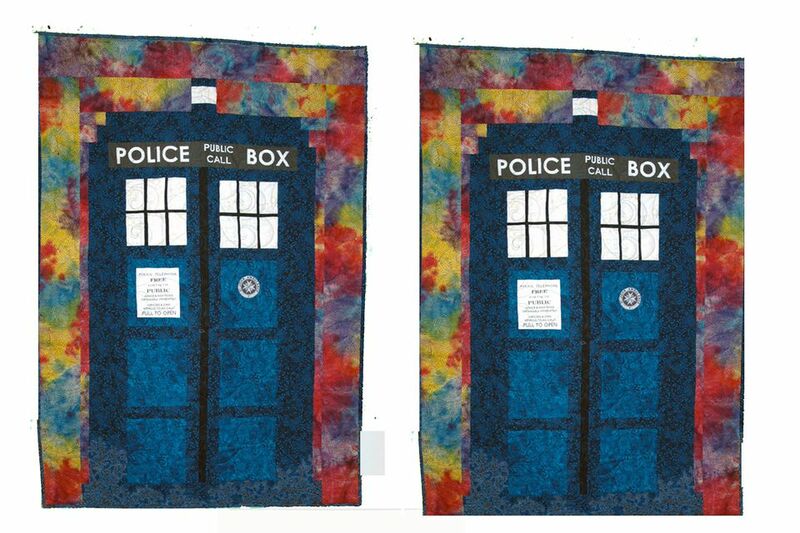 Try this TARDIS quilt pattern to make a wall hanging sized quilt for your favorite Doctor Who fan. For those of you unfamiliar with the TARDIS, it's Doctor Who's spacecraft and time machine, which looks like a blue Police Call Box, and was given its name by the Doctor's granddaughter, Susan, when the BBC's sci-fi series first aired during the 1960's. The name is short for Time and Relative Dimension in Space, and although the spacecraft looks like a small call box on the outside, it's bigger on the inside -- Time Lord technology. Oh yes, the Doctor is an alien from the planet Gallifrey. Doctor Who celebrated its 50th anniversary at the end of 2013, although it was off-air for a fairly long period before returning in 2005. Since its return, the series has skyrocketed in popularity, gaining millions of new fans worldwide. Doctor Who fans know all of that (and everything else about the Doctor) so it's probably enough of an explanation. The quilt finishes at about 30" x 42". The instructions may seem kind of complex and lengthy because several techniques are used and they include options for some areas of the quilt, but it really is an easy project. I suggest you read through the entire pattern before beginning. Over the years, the TARDIS has ranged in color -- always blue, but different blues. This quilt represents the 11th Doctor's TARDIS, which is 'the bluest of blues.' It's sewn with two blue print fabrics, one for the door inserts and a darker blue for framing. A narrow black strip is sewn between the doors to help separate them visually. Windows are sewn from a slightly splotchy white fabric and black frames divide each window into six sections. White is repeated in the 'light' at the top of the box. A multicolored batik surrounds the TARDIS. A tie-dye fabric would be a good choice -- something that resembles the TARDIS as it spins away at the beginning of some episodes. I did not add a border to the bottom of my quilt, but that's certainly an option. Option: You could use a third blue to surround the door insets, and then save the darkest fabric for outermost areas. Read the actual cutting instructions to determine how much of a third fabric would be required. For the door signs and police call box wording. You can try EQ Fabric Sheets, but there are other choices. Two 8-1/2" x 11" sheets are required but you might need more to experiment a bit. Sew the TARDIS quilt with an accurate quarter inch seam allowance and press after every step. Sew carefully to avoid averaging strip lengths like we do for borders. At the end, this quilt was off by just under 1/8" for the final strip, making it simple to ease in the tiny difference. Cutting instructions reflect the actual sizes required if everything goes together as it should. Sew the long strips to their counterparts like you do borders -- match ends and midpoints first, and then continue aligning and matching remaining edges. It's best to use straight pins to hold the pieces together (pressing unsewn pieces helps them stick, too, but isn't always helpful for long pieces of patchwork). It's important to be very accurate when cutting the long, narrow strips of fabric. Write strip dimensions on a slip of paper and pin to the matching group. Download the PDF file for door signs. Print and treat the fabric as directed by the manufacturer. Use your choice of fonts to print. Ignore the lines around the rectangular image -- it needs to come inward on each side. Center the wording in an area that's about 4-1/4" x 5", making sure that there's at least 1/2" blank space on all sides (1/4" will be seam allowance, the other 1/4" will be part of the sign's background). You can be exact by determining how wide strips must be to make the unfinished size of your door panel measure 5-3/4" x 6-1/2". Or you can fudge a little by cutting strips that are wider than necessary (lengths should be exact). Sew the strips to opposite sides first and press. Then sew strips to the remaining two sides and press. Center the door sign and trim back the panel to achieve the correct size (5-3/4" x 6-1/2"). Try to keep blue edges as even in width as possible, but don't stress the small stuff. Cut out and affix the circle to the upper central portion of a door panel. Use fusible web or applique to place the circle on the panel. This quilt was sewn with the sew and turn method explained in the Dresden Plate pattern, sewing fusible web around the circle (directly on the line) with its 'sticky' side touching the right side of the printed circle. When the fusible web is clipped at its center, and the piece is turned, the sticky side will be on the back, and the circle can be pressed in place and then surrounded by hand or machine stitching. If using traditional applique, add a seam allowance around the circle's outer line. Some Doctors did not have a TARDIS with this symbol. Download the PDF file for the TARDIS Windows. Templates are illustrated above, but will not print the correct size. Use the PDF file and print 2 copies at 100%. If you are not familiar with paper piecing, read How to Paper Piece, and review the illustrations in the Scrappy Whirlwinds quilt pattern and the paper pieced Courthouse Steps quilt block. Don't worry if this is your first paper pieced project -- the windows are very simple versions of the technique. Since the paper piecing for this project is not intricate, regular copier paper is fine (it pulls away easily from large areas). Sheer vellum is even better because lines are visible from both sides. Newsprint works nicely, too, because it pulls away easily. Use what's handy. The narrow strips and the lower edge of the top section of the windows are black, the rectangles are all white. Cut only a few pieces from the list below until you're sure the sizes will work for you -- everyone positions fabric a bit differently. Adjust dimensions as needed. Cut away excess paper from each template after printing. Leave a bit of space around each template (you'll trim on the printed lines later). Start with one of the top templates -- with the horizontal bar across its bottom. Center a white patch right side up within the printed lines for the left rectangle -- you're positioning fabric on the back side of the template after holding it to the light to detect the lines. The patch should overlap all lines by about 1/4", or enough to create a stable seam allowance when those lines are sewn. Hold the aligned patch in place with a straight pin. Place a 3-1/2" long black strip right side down along the right-hand edge of the white patch. Hold in place (use a pin if necessary). Turn the unit over and sew a seam on the template line that separates those two patches, starting and stopping a bit past each end. Remove from the machine and flip the black patch right side up. Check the seam allowance. If too wide, trim it back a bit now. Press with an iron or finger press firmly to make sure the patch is flat (iron is best). Align a second rectangle right side down alongside the edge of the black strip. Hold in place, flip over and sew on the next template line. Trim and press as before. Sometimes, when using oversized strips, the patches start to 'grow.' In other words, are out of kilter with the next seam. Monitoring where the actual lines are will help you position fabrics. One way is to stick a straight pin through the line from the printed side -- overlap the area by 1/4" and then turn over and sew on the next line. Add a second dark strip using the same technique, and then finish with a light rectangle. Examine the bottom edges of the strips. If they overlap the first horizontal line by too much, go ahead and trim them back, leaving 1/4" or so. Align the 1" x 6" strip right side down on those edges, and then flip the piece over and sew on the line. Press. Trim through all layers on the outermost template line. Remove papers. Make the second unit with a dark bottom in the same way. Make the two units without a dark bottom in the same way (there's no bottom strip). Sew a window top and bottom together (the black horizontal strip becomes the middle of the window). Press. The window should measure 5-3/4" x 6-1/2". Repeat to assemble the remaining window. You could cut single window panels slightly larger than door insert panels and align narrow black binding (purchased in a package) to create the window frames, sewing them to the panel with black thread. Each panel must be trimmed to 5-3/4" x 6-1/2" after adding the binding. If you choose the binding method, the window templates (link below) can be used to help align strips on the fabric. Print and cut out the templates, overlapping the bottom edge of the top template with the top edge of the bottom template (1/4" each) to remove the middle seam allowance. Tape the two together and center under the fabric to use as a guide (remembering that you've cut an oversized white window that must be trimmed back). Binding strips may be the best option for quilters who do not like to paper piece. The image above includes some of the framings, but here's an image of just the TARDIS door panels. Gather one window, the door inset with a large sign, two 5-3/4" x 6-1/2" light blue door inserts and four 1-5/8" x 5-3/4" dark framing strips. Units are oriented with their 5-3/4" edges running horizontally. Press seams either direction in the following steps. Sew a dark framing strip to the top of the window, followed by another dark framing strip beneath the window. Sew the panel with sign inset to the column next, followed by another narrow framing strip. Sew one of the remaining door panels next, followed by another framing strip. Sew the remaining blue panel to the bottom of the column. After pressing, each door panel column should measure 5-3/4" x 29". Sew a 1-5/8" x 29" dark blue framing strip lengthwise to each side of each door. If lengths do not match panels exactly, match endpoints and midpoints first, and then match remaining edges along each `door. Press seam allowances towards the strip (for less bulk, but either way is fine). Sew the 1-1/4" x 29" black strip lengthwise between the doors, matching edges as in Step 1. Press seams either direction. Sew a 2-3/4" x 29" dark blue strip lengthwise to each side of the doors (not shown in the photo). Press seam allowances towards the wider strips. The call box lettering is in two strips. They are taller than necessary, but cut out on the outermost lines -- you'll trim back later. They will also be pieced together somewhere between the lettering. Read the following instructions before you begin. Place your partial TARDIS on a table or other flat surface. Print the PDF file to fabric and 'set' the inks according to the manufacturer's instructions (or with the technique you use for fabric pressed onto freezer paper). Your printer will likely have cut off 1/2" or so on strip ends -- trim those empty spaces and arrange the lettering above the panel. Overlap the strips to center them over the partial TARDIS - refer to the photo on Page 1. Once you've established the correct overlap, trim each strip where they will meet, leaving an extra 1/4" on the end of each strip (where they will meet) for the seam allowance. Check the alignment of letters -- if bottom edges don't match, shift one strip or the other upwards a bit. Sew together and press seam open. Trim the height of the strip so that it is 2-3/4" tall. Remember that a 1/4" seam is sewn along its top and bottom -- trim in a way that keeps letters from being caught in seams. Align the strip with the top of the partial TARDIS. Where do you want the strip to end? Trim so that the same amount of space remains before and after the printed lettering, remembering again that 1/4" on each end will become seam allowance. Make the strip a length that's easy to measure with rotary rulers. Measure the length of the trimmed strip and subtract 1/2". Subtract that number from 20-1/4" and divide by 2. Add 1/2" to that number and cut two dark blue framing patches that length and 2-3/4" tall. Sew one piece to each end of the lettering strip. Press towards the blue strips. The completed call box strip should measure 2-3/4" x 20-3/4". Sew it across the top of the TARDIS, matching as before. Press seam away from the printed fabric (it will probably be a bit stiff from all the ink). EASY OPTION: The blue strips at the ends of the call box lettering are always cut 2-3/4" tall, but for simplicity, cut them longer than the calculation and sew to ends. Press and then trim back strip to 20-3/4" in length, centering the lettering and making the blue ends as close to the same length as possible. Sew to the top of TARDIS. Sew a 1-1/4" x 31-1/4" background strip lengthwise to each side of the TARDIS (not shown, but you can refer back to the photo on page 1). Press seam allowances either direction. One more addition that isn't shown -- sew the 2-3/4" x 22-1/4" dark blue framing strip to the bottom of the TARDIS. Press seam allowance towards the new strip. Make the Upper Sections of the TARDIS. Refer to the drawings to make upper units. Press seam allowances towards the darker strips. Follow illustrations from top to bottom. Sew a 3-1/2" x 10-1/4" background strip to each side of the light. Press. Sew a 1-5/8" x 2-3/4" background bar to each end of the 1-5/8" x 17-3/4" dark blue strip. Press. Sew a 2" x 2" background square to each end of the 2" x 19-1/4" dark blue strip. Press. Sew the three panels together in the order shown. Press. Sew the top panels to the top of the TARDIS. Press. Borders can be cut from 4-1/2" wide crosswise grain strips of the border/background fabric. Add the side borders first, and then the top border (and a bottom border if you like). Measure accurately for border length and sew to the quilt as described in my quilt borders tutorial. The 'textbook length' for side borders is 39-1/8" -- yours may differ. Use the borders as an opportunity to square up a slightly skewed quilt -as explained in the tutorial. Press the quilt and mark for quilting if necessary. Sandwich with batting and backing. Baste in a way that's appropriate for your quilting method. Quilt and sew mitered binding around the quilt's edges, adding the hanging sleeve.